April L. Hernandez, Jaclyn Ngan, Sergio Montalvo, Jason Finn, Vanetta Smith, Giovannie Samuels, and Ahn Tuan Nguyen wear black high top and low cut Converse “Chuck Taylor” All Stars in the film. Erin Gruwell is an enthusiastic new teacher at Woodrow Wilson High School. The early 90’s were a trying period for the city of Los Angeles. The city was experiencing a massive tide of racial tension that boiled over in the taped beating of Rodney King. Following King’s beating and the non-guilty findings of the cops who did so, the city exploded into massive riots. Following the LA riots, the racial tensions in the city were at an all time high. These trying times are captured in Freedom Writers, the true story of Long Beach high-school teacher Erin Gruwell. Based on the book by Gruwell, which details her story through her own words and the diary entries of her students, the film does a solid job of putting a convincing and thoughtful take on a well used genre. Eva has a lot on her mind as she is asked to testify against her own father. Erin Gruwell (Hilary Swank) is a 23-year old student teacher assigned to Woodrow Wilson High School in Long Beach, CA, which has recently implemented a racial integration program. She finds out her class is filled with “at-risk” students, who could care less about school and each other. The students quickly segregate themselves by race, leading to gang fights amongst each other. One student, Eva (April Lee Hernandez), is in a particularly tough spot. Having joined a gang at a young age, she’s recently witnessed the murder of another man by her own boyfriend. She is summoned to testify against him, and initially disagrees to do so in order to not rat out her own. Gruwell slowly warms to her students, and even takes multiple jobs to buy supplies for them, which puts a great deal of strain on her marriage. Along the way, Gruwell teaches her students to break free of their set stereotypes and push themselves. The class begins to respond to Erin’s teaching techniques.. 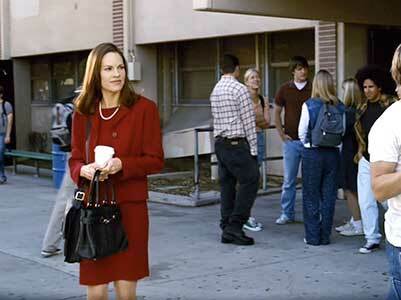 There have been plenty of films of this type, but Freedom Writers does not fall into the trap of being a trope. The pieces are all there though, the young, inexperienced teacher, troubled kids, an oppressive school system, the harsh administrator, etc. Yet this true story is quite well done. Swank is solid as Gruwell, and displays the chops she used to full effect in some of her strongest roles. The students, especially Hernandez’s Eva, are well portrayed as well. Their journey from angry, despondent kids to more thoughtful young adults is a convincing one, and one the audience can get behind. The class looks around when they are invited to a banquet. Adding to the weight of the film is the larger part of the narrative. The small scale story of Gruwell and her class is solid, yet what happens outside the classroom is the far more compelling nature of Freedom Writers. The racial tensions of gangland Los Angeles are shown to full effect here, and thoughtfully done. 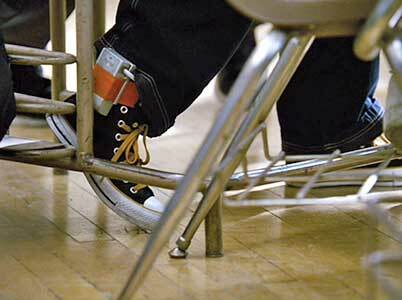 Scenes displaying the harshness of gang life and its mindless violence add much more weight to the classroom scenes. One particular reversal towards the end of the film adds a fulfilling completion to this story of change. The only real downside of the film is Gruwell’s personal story, as her husband is portrayed as somewhat of an antagonist. His disgruntlement at her commitment towards her students is not well rooted, and paints him as essentially a jerk. Many of the Freedom Writers wear chucks. Closeup of Eva’s black and amber high top chucks and her tracking device. Many of the students in Mrs. Gruwell’s class wear black high top chucks, with Eva being one of the most prominent characters wearing them. Black high tops and low cut chucks are seen in a number of incidental shots. They are a popular choice for Southland gang-bangers and regular teens in this film. The class lines up to learn about racial divides. Freedom Writers. (2007) Hilary Swank, Patrick Dempsey, Scott Glenn, Imelda Staunton, April L. Hernandez, Mario, Kristin Herrera, Jaclyn Ngan, Sergio Montalvo, Jason Finn, Deance Wyatt, Vanetta Smith, Giovannie Samuels, Ahn Tuan Nguyen. Written and directed by Richard LaGravenese. Categories: Drama, Coming of Age, Crime.